Sometimes, when success emboldens a playwright to reach beyond the ordinary, sublime work results. Such is the case with Amadeus, Peter Shaffer’s drama about the life of Wolfgang Amadeus Mozart, now playing at Hubbard Hall in Cambridge New York. Though many have seen the film based on the play, sitting mere feet from formidable actors transports us to the palace drawing rooms and destitute flats of Eighteenth Century Vienna in a way that film cannot. And what a journey it is. In two acts we witness the life and death struggle of Wolfgang Amadeus Mozart and Antonio Salieri, court composer to Emperor Joseph II, who vie to present their best art to the world. In the process, art itself is examined, as are fate, talent, ambition, intrigue, family responsibility and devotion to God. Mozart’s seemingly effortless genius is naïvely drawn into war with Salieri’s persistent mediocrity and murderous jealousy. The fictitious narrative takes place in the last hour of Salieri’s life as a flashback to his youth when the even-younger Mozart arrives on the scene to compete for funds from the city’s royal and wealthy patrons. Mozart’s innate freedom to break musical convention allows him to compose circles around Salieri, However, this same tendency expresses itself as flagrant disregard for social mores. In short order, Mozart’s tasteless behavior threatens the very relationships he needs to survive. Being well trained, Salieri realizes how his employment and position in history are threatened by Mozart’s gifts and he succumbs to using guile to destroy his foe. In the ensuing battle we see, and hear, Mozart composing his finest work against great odds. Hubbard Hall’s antiquity—high ceilings, wood floors and velvet curtain—enhances our flashback to the time. While the proscenium stage is used for vignettes in the palace, opera houses and Bauhaus, where such distance is appropriate, the intimate work of the play takes place amongst the risers. The set centers on a grand piano and, to our great delight, both lead actors play some of their music live. In one of theater’s most challenging roles, John Hadden (current Artistic Director of Hubbard Hall) turns actor. 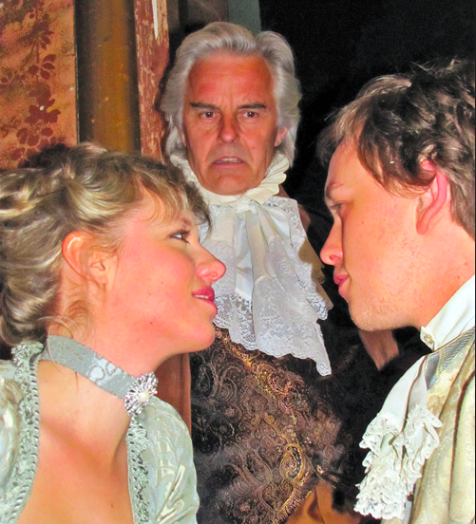 As Salieri, he embodies the essence of longing, deceit and jealousy. His emotive power and stamina are true to Salieri’s ambition. In the vast ranging role of Mozart, Miles Mandwelle moves with confidence from childish brilliance to broken soul. Besty Holt, as Mozart’s wife Constanze, deftly shows a woman being honed by the failings of both men, turning from selfish girl to strained wife to saint and finally to exploiter of her dead husband’s work, with which profits she takes care of her children. In fabulous period costumes by Sherry Recinellas, the supporting cast plays multiple roles as dukes and derelicts, grand dames and gossiping ne’er-do-wells. They create operas, complete with onstage audience, numerous plays within this one play. We follow them all, hating the inevitable conclusion. Was it consumption, syphilis, poison, broken heart that killed Mozart? Excellence as we see here is not random. We are fortunate that Jeanine Haas (Artistic Director of Pauline Production Theater Company in Massachusetts) jumped at the chance to direct this complex show. The lighting and choreography delight the eye. And all through is Mozart’s music, which steals every show . . . except this one.